The Association of the United States Army (AUSA) Braxton Bragg Chapter invites you to join us at our 19th Annual Soldier’s Appreciation Golf Tournament. The tournament will be held September 29, 2017 at the Stryker Golf Course, Fort Bragg, North Carolina. Registration begins at 8am, with a shotgun start at 10am. 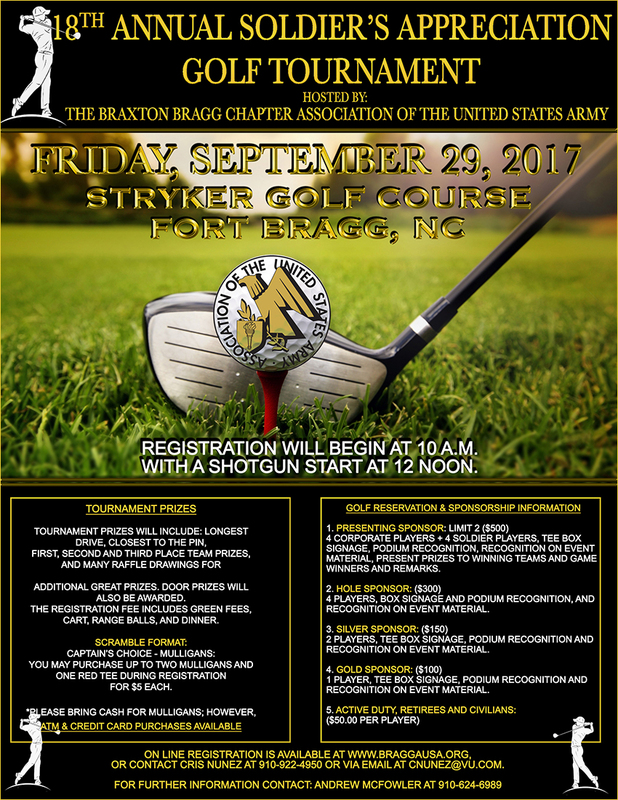 Every year the Braxton Bragg Chapter hosts a golf tournament to give special thanks to the Soldiers and Families of the Fort Bragg community. Many of the Corporate Members and other local businesses participate as a means of showing their support for our community family. This is a great event for Soldiers to have some fun and interact with Community Leaders who support them. Please contact Gary Kirschenman at 910.396.3755 or via email at [email protected] for questions and registration. The Army is not endorsing, promoting nor advertising for any of the AUSA’s sponsors.